A big, temptingly hoppy Double IPA with plenty of bite! Our assertive, hop-centric Road 2 Ruin has a lean malt character and is brewed with seven Pacific Northwest hop varieties including Cascade, Centennial, Amarillo and Citra. 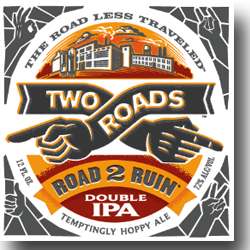 "Beer Description" content and image are the property of Two Roads Brewing Co. and are used for informational purposes only.